Charters Towers is a town in northern Queensland, Australia. It is 134 kilometres (83 mi) inland (south-west) from Townsville on the Flinders Highway. In 2016 the population was 8,120 people. During the last quarter of the 19th century the town boomed as the rich gold deposits under the city were developed. After becoming uneconomic in the 20th century, profitable mining operations have commenced once again. The town was founded in the 1870s when gold was discovered by chance at Towers Hill on Christmas Eve 1871 by 12-year-old Aboriginal boy, Jupiter Mosman. Jupiter was with a small group of prospectors including Hugh Mosman, James Fraser and George Clarke. Their horses bolted after a flash of lightning. While he was searching Jupiter found both the horses and a nugget of gold in a creek at the base of Towers Hill. Charters originated from the Gold Commissioner, W.S.E.M. Charters. A total of ten major gold reefs were eventually mined. Such were the boom years, between 1872 and 1899, that Charters Towers hosted its own stock exchange. The Great Northern railway between Charters Towers and the coastal port of Townsville was completed in December 1882. During this period, the population was approximately 30,000, making Charters Towers Queensland's largest city outside of Brisbane. The city was also affectionately known as 'The World', as it was said that anything one might desire could be had in the 'Towers', leaving no reason to travel elsewhere. The Borough of Charters Towers was proclaimed on 21 June 1877 under the Municipal Institutions Act 1864 with John McDonald being elected the town's first mayor. The local government area would later be known as Town of Charters Towers and City of Charters Towers, before being absorbed into the Charters Towers Region. Charters Towers Post Office opened on 17 May 1872. A 20 head of stamps mill began ore crushing operations on 16 July 1872. The Venus Battery continued to be used by small mine in the region until 1971. The unique site remains intact today, together with a cyanide treatment plant and assay office. On Sunday 10 August 1884, the new Charters Towers District Hospital opened. By 1917 gold mining became uneconomic. During World War I labour was hard to find, and as the mines drove deeper, ventilation and water problems arose. This production decline was similar across Australian gold mines, with rising costs and a fixed gold price eroding profitability. The town entered a long period of relative stagnation and little further development has occurred since. The Charters Towers gold field produced over 200 tonnes (6.6 million troy ounces) of gold from 1871–1917. The gold is concentrated into veins and was Australia's richest major field with an average grade of 34 grams per tonne. The grade was almost double that of Victorian mines and almost 75% higher than the grades of Western Australian (Kalgoorlie) gold fields of that time. At 18 Gill Street the heritage listed former Pollard's department store is now most likely the only Target or Target Country store which features leadlight windows. According to the 2016 census of Population, there were 8,120 people in Charters Towers. Aboriginal and Torres Strait Islander people made up 10.9% of the population. 83.3% of people were born in Australia. The most common countries of birth were New Zealand 1.5% and England 1.3%. 87.6% of people spoke only English at home. The most common responses for religion were No Religion 24.4%, Catholic 23.5% and Anglican 18.0%. 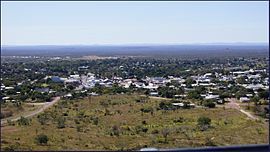 Charters Towers township is mildly elevated at 300 metres above sea-level, but this has a noticeable effect, with lower humidity and bigger temperature variations than nearby Townsville. Charters Towers obtains its water supply from the nearby Burdekin River. The urban area of the town of Charters Towers includes its suburbs: Charters Towers City (the centre of the city); Richmond Hill, Toll and Columbia to the north, Queenton to the east, Grand Secret and Alabama Hill to the west, and Towers Hill, Mosman Park and Millchester to the south. Charters Towers has a tropical climate with distinct seasons. Summers are hot and often rainy, whereas winters are mild and dry with low humidity. Charters Towers is a regional centre for the mining industry, the beef industry and education, specifically boarding schools catering for remote rural families. It has been estimated that there exists more gold underground than the total removed in the gold rush. Hundreds of separate mining leases covering an area of 200 square kilometres were consolidated by James Lynch in the 1970s and 1980s and the company Citigold listed on the Australian Securities Exchange in 1993. After 89 years the goldfields were reopened and gold was produced again from the Warrior Mine 4 kilometres (2.5 mi) southeast of the town in November 2006 by Citigold Corporation Limited. Gold is mined from two deposits which are accessed by sloping tunnels. The extracted gold ore is trucked about 10 kilometres (6.2 mi) south west of the city for processing into gold Doré bars. Citigold has announced plans to open three mines directly under the city to extract gold at a rate of 250,000 ounces per year. Charters Towers has four secondary schools: Columba Catholic College (opened in 1998); Blackheath and Thornburgh College (opened in 1919); All Souls St Gabriels School (opened in 1920); and Charters Towers State High School (opened in 1912). The nearest university is the James Cook University, in Townsville. Charters Towers is well known as a boarding school town, with families from western Queensland, the Northern Territory, Western Australia and the Torres Strait Islands sending their children to school in the district, over the larger cities in the area such as Townsville and Cairns. The Alliance of Charters Towers State Schools (ACTSS) represents the five State schools in the area that are funded by the Queensland Government – Charters Towers Central State School (opened in 1875), Millchester State School (opened in 1874), Richmond Hill State School (opened in 1895), Charters Towers School of Distance Education (opened in 1987) and Charters Towers State High School. A number of other state schools within the city and nearby vicinity, which mostly commenced during the mining boom years have also existed. These included Queenton State School (1890–1933), Mt. Leyshon State School (1890 – c.1940), King's Gully State School (1911–1932), The Broughton State School (1905–? ), Macrossan State School (1884–19?? ), Rishton State School (1884–1891), Liontown State School (1905 – c. 1921), Black Jack State School (1887–1948), Pumping Station State School (1898–1936), and Sellheim State School (1889–1939). The Charters Towers Regional Council operates the Charters Towers Excelsior Library in Charters Towers at 130 Gill Street. The Charters Towers branch of the Queensland Country Women's Association meets at the Jane Black Memorial Hall at 80 Mossman Street. Jane Black of Pajingo Station was a pioneer of the Charters Towers branch but also one of the founders of the Country Women's Association in Queensland as a whole. The hall was officially opened on Thursday 22 July 1954. The Northern Miner newspaper (not to be confused with The Northern Miner, a mining publication in Canada) was first published in August 1872, just eight months after the discovery of gold. Such was its strength in those gold mining days of the late 1880s that The Northern Miner installed a then revolutionary linotype slug casting machine before Brisbane's The Courier Mail. It was the only newspaper (of five published during the boom gold years) that survives today. In 2000, The Northern Miner was linked for the first time to the North Queensland Newspaper Company and therefore News Limited's electronic layout system and website. The Charters Towers E-Village launched in 2011 and provides a location where people can connect with the Charters Towers community. The E-Village is the creation of local resident, Bryan West, following his frustration at not being able to find a suitable date for a Kindergarten working bee. It includes a community calendar, member pages for all Charters Towers organisations, a database of services available within and to the community, classifieds, daily weather, and an online shop. It has a daily news service that originates and aggregates content from and relevant to the Charters Towers community, which is delivered through a Facebook page and free daily newsletter. Because it has a lower than national proportion of households with reliable internet access, the Charters Towers E-Village installed a free public wireless internet service in the main street of the town, in conjunction with local businesses. Since its inception in 2011, it has grown to receive about 1,500 visits each day. The E-village derives its income from related web-services, with any profits being returned to the Charters Towers community. The Evening Telegraph was a daily newspaper published between 1901 and 1921. The Charters Towers Goldfield Ashes has been an amateur cricket carnival conducted over the long week-end in January since 1948 by the Charters Towers Cricket Association Incorporated (CTCA), and it is now the largest in the southern hemisphere. Players ranging from regional and the country to play. Numbers in recent years have reached just shy of 200 teams. The event is of massive benefit for the town bringing in business for the entire region, especially the town's pubs and clubs. While the higher grades take it very seriously with awards and prizes given, the lower grades take to a more social view. Games involving drinking penalties and costume wearing are all part of the antics. In 2010, more teams were involved than ever. However, the competition did not reach the magic two hundred team only because of the lack of fields in the region. Many of the fields are concrete pitches on the properties of local families in the region. During World War 2, Charters Towers was the location of RAAF No.9 Inland Aircraft Fuel Depot (IAFD), completed in 1942 and closed on 29 August 1944. Usually consisting of 4 tanks, 31 fuel depots were built across Australia for the storage and supply of aircraft fuel for the RAAF and the US Army Air Forces at a total cost of £900,000 ($1,800,000). For mayors of Charters Towers, see City of Charters Towers#Mayors. ^ a b c Australian Bureau of Statistics (27 June 2017). "Charters Towers (Urban centre/Locality)". 2016 Census QuickStats. Retrieved 2 December 2017. ^ "Charters Towers - town (entry 6945)". Queensland Place Names. Queensland Government. Retrieved 21 June 2016. ^ a b c d Charters Towers Story Archived 22 April 2016 at the Wayback Machine. Citigold Corporation. January 2010. Retrieved 30 April 2016. ^ a b c d "World History". Charters Towers Regional Council. Archived from the original on 25 May 2016. Retrieved 30 April 2016. ^ "Agency ID11207, Charters Towers Municipal Council". Queensland State Archives. Retrieved 20 September 2013. ^ a b Cook, Penny (2006). Discover Queensland Heritage. Corinda, Queensland: Pictorial Press Australia. p. 25. ISBN 1876561424. ^ "The Northern Miner". The Northern Miner. IV, (352). Queensland, Australia. 11 August 1884. p. 2. Retrieved 8 October 2017 – via National Library of Australia. ^ "Church of Christ, Charters Towers (entry 601245)". Queensland Heritage Register. Queensland Heritage Council. Retrieved 7 July 2013. ^ "Boer War Veterans Memorial Kiosk and Lissner Park (entry 600397)". Queensland Heritage Register. Queensland Heritage Council. Retrieved 7 July 2013. ^ "Charters Towers Airfield Bore Sight Range and Compass Swinging Platform (entry 602739)". Queensland Heritage Register. Queensland Heritage Council. Retrieved 7 July 2013. ^ "Aldborough (entry 602668)". Queensland Heritage Register. Queensland Heritage Council. Retrieved 7 July 2013. ^ "Signals, Crane and Subway, Charters Towers Railway Station (entry 602627)". Queensland Heritage Register. Queensland Heritage Council. Retrieved 7 July 2013. ^ "Charters Towers Post Office (Place ID 105523)". Australian Heritage Database. Department of the Environment. Retrieved 30 September 2018. ^ "Fossey's Store, Charters Towers (entry 601259)". Queensland Heritage Register. Queensland Heritage Council. Retrieved 7 July 2013. ^ "Bank of New South Wales (former) (entry 602804)". Queensland Heritage Register. Queensland Heritage Council. Retrieved 7 July 2013. ^ "Charters Towers Police Station (entry 600401)". Queensland Heritage Register. Queensland Heritage Council. Retrieved 7 July 2013. ^ "Bell Tower, St Columba's Church (entry 600399)". Queensland Heritage Register. Queensland Heritage Council. Retrieved 7 July 2013. ^ "Ambulance Building (former) (entry 650009)". Queensland Heritage Register. Queensland Heritage Council. Retrieved 22 December 2017. ^ "Charters Towers Central State School (entry 602846)". Queensland Heritage Register. Queensland Heritage Council. Retrieved 20 December 2017. ^ "School of Mines, Charters Towers (entry 600402)". Queensland Heritage Register. Queensland Heritage Council. Retrieved 7 July 2013. ^ "Charters Towers Court House (entry 600403)". Queensland Heritage Register. Queensland Heritage Council. Retrieved 7 July 2013. ^ "Ay Ot Lookout (entry 600404)". Queensland Heritage Register. Queensland Heritage Council. Retrieved 7 July 2013. ^ "Thornburgh House (entry 600405)". Queensland Heritage Register. Queensland Heritage Council. Retrieved 7 July 2013. ^ "Venus State Battery (entry 600413)". Queensland Heritage Register. Queensland Heritage Council. Retrieved 7 July 2013. ^ "Bartlam's Store (former) (entry 600409)". Queensland Heritage Register. Queensland Heritage Council. Retrieved 7 July 2013. ^ "ED Miles Mining Exchange (former) (entry 602801)". Queensland Heritage Register. Queensland Heritage Council. Retrieved 7 July 2013. ^ "Stock Exchange Arcade (entry 600406)". Queensland Heritage Register. Queensland Heritage Council. Retrieved 7 July 2013. ^ "Australian Bank of Commerce (former) (entry 600407)". Queensland Heritage Register. Queensland Heritage Council. Retrieved 7 July 2013. ^ "Lyall's Jewellery Shop (entry 600408)". Queensland Heritage Register. Queensland Heritage Council. Retrieved 7 July 2013. ^ "Day Dawn PC No.3 Shaft mine remains (entry 602200)". Queensland Heritage Register. Queensland Heritage Council. Retrieved 7 July 2013. ^ "Pfeiffer House (former) (entry 600410)". Queensland Heritage Register. Queensland Heritage Council. Retrieved 7 July 2013. ^ "Charters Towers Masonic Lodge (entry 600411)". Queensland Heritage Register. Queensland Heritage Council. Retrieved 7 July 2013. ^ "Civic Club (entry 600398)". Queensland Heritage Register. Queensland Heritage Council. Retrieved 7 July 2013. ^ "Towers Hill (entry 601851)". Queensland Heritage Register. Queensland Heritage Council. Retrieved 7 July 2013. ^ "Charters Towers Gold Mine Shafts and Remains (entry 602221)". Queensland Heritage Register. Queensland Heritage Council. Retrieved 7 July 2013. ^ "Stone kerbing, channels and footbridges of Charters Towers (entry 602512)". Queensland Heritage Register. Queensland Heritage Council. Retrieved 7 July 2013. ^ "Climate". www.drytropics.org.au. Archived from the original on 2 March 2019. Retrieved 18 April 2019. ^ "Queensland Globe". State of Queensland. Retrieved 21 June 2016. ^ "Climate Statistics for Charters Towers Airport". Bureau of Meteorology. Archived from the original on 12 September 2018. Retrieved 12 September 2018. ^ "Climate Statistics for Charters Towers Post Office". Bureau of Meteorology. Archived from the original on 12 September 2018. Retrieved 12 September 2018. ^ a b c "Mining Overview". Citigold Corporation. January 2010. Archived from the original on 22 April 2016. Retrieved 30 April 2016. ^ a b c d e f g h "Opening and closing dates of Queensland Schools". Queensland Government. Retrieved 18 April 2019. ^ "Charters Towers". Public Libraries Connect. 1 November 2017. Archived from the original on 29 January 2018. Retrieved 29 January 2018. ^ "Janel Black Memorial Hall Open". Townsville Daily Bulletin. LXXIV. Queensland, Australia. 23 July 1954. p. 6. Retrieved 30 December 2018 – via National Library of Australia. ^ "OPENING OF JANE BLACK MEMORIAL HALL". Townsville Daily Bulletin. LXXIV. Queensland, Australia. 24 July 1954. p. 1. Retrieved 30 December 2018 – via National Library of Australia. ^ "About Us". The Charters Towers E-village. Archived from the original on 25 June 2012. Retrieved 7 June 2012. ^ Kyle, Noeline J. (1993). "Allan, Margaret Theadora (1889–1968)". Australian Dictionary of Biography. Australian National University. Archived from the original on 5 April 2015. Retrieved 30 March 2015. ^ Argent, A. (1988). "Hugh Quinn". Australian Dictionary of Biography. 11. Canberra: Australian National University. Retrieved 16 January 2016. ^ Barker, Anthony (1990). "Timms, Edward Vivian (1895–1960)". Australian Dictionary of Biography. Australian National University. Archived from the original on 3 April 2015. Retrieved 30 March 2015.